Nothing special about this McDonald's. 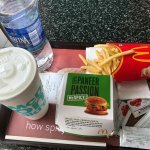 Just the regular McDonald's food & the good service. Normal seating overlooking the Karol Bagh market. This place reminded me of UK McDonald's back in the 80s and felt a bit like stepping back in time. 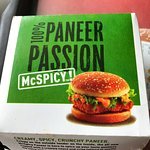 I like the way how Indian McDonald's cater for vegetarians, I know it's linked to religion here but I wish mcD's in other countries offered the same level of service and care.